The battle lines are being drawn in Mullion over the proposed expansion of a holiday lettings company. Cornish Cottages Ltd was granted planning permission last March for a two-storey office at Mullion Meadows Craft Centre. However, local objectors to the scheme managed to put a halt on the building work after it was discovered that there was a right of way under the old barn that the new building was replacing. 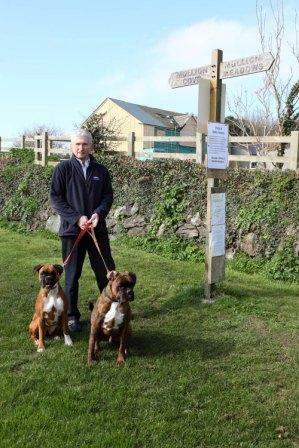 Owners Martin and Pauline Raftery applied to divert the footpath, but at its January meeting Mullion Parish Council voted against. Now local residents in favour of the expansion have formed a support group – Friends of Mullion Meadows – to raise awareness of the positive impact and support that Mullion Meadows Craft Centre brings to the village; in addition to highlighting the benefits to the local economy. A representative from ‘Friends of Mullion Meadows’ said: “We find it a shame that Mullion Meadows cannot continue with their new building due to a public footpath issue. The next Parish Council meeting is on Tuesday, March 15 at 6-45pm in the Methodist Hall.